SnapWriter 1.0 has been released! It is ideal tool for capture and edit your recent notes into Evernote. SnapWriter is a quick and easy app for your diary, journal and life log. One tap to open, one tap to send and quick edit your notes. Quickly add checkboxes, photos, timestamp, reminders, bullets, tags and select notebooks. Quick and reliable synchronization between devices through Evernote. 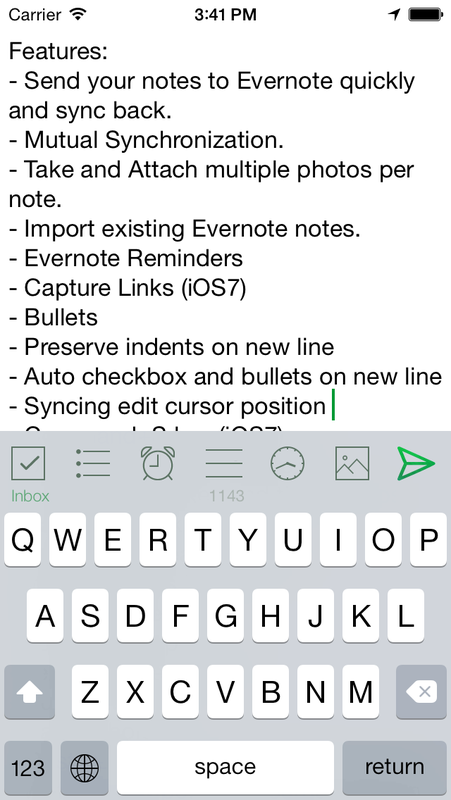 Import notes from Evernote. Send notes to SnapWriter using 'SnapWriter' tag. Text editing assisted with Clear/Undo/Redo and auto-save even in offline. Additional gestures help moving cursor and undo/redo. Select one of several notebook paper choices. - Send your notes to Evernote quickly and sync back. - Import existing Evernote notes. - Discard (Hold Save button). - Insert checkboxes and timestamps. - Select and create Evernote notebooks/tags in place. - Quick launch for typing on the go, keyboard is up by default. - 'Facebook', 'Twitter', 'Messages', 'AirPrint' support. - Delete or archive choices. Any plans for a Windows and Android version? The iOS8 update has been approved by Apple.